Alabama football is the most valuable sports property that is not the Olympics or in the NFL. And that's why Nick Saban could get a 10-year, $125 million offer from the Green Bay Packers and Alabama would counter with a 12-year, $200-million offer. The returns on investment that are better than Saban are great quarterbacks on their rookie deals and the SEC football package on CBS, which retails for about $55 million per year. The former situations are predicated on luck; the latter for CBS is staggering, considering the Eyeball Network pays $55 million per year and got better ratings on the SEC title game than either of the semifinals, which is part of the billion-dollar deal that ESPN pays for the college football playoff. Of course Saban is a fixture in both of those deals, too. But how big is the Saban factor? 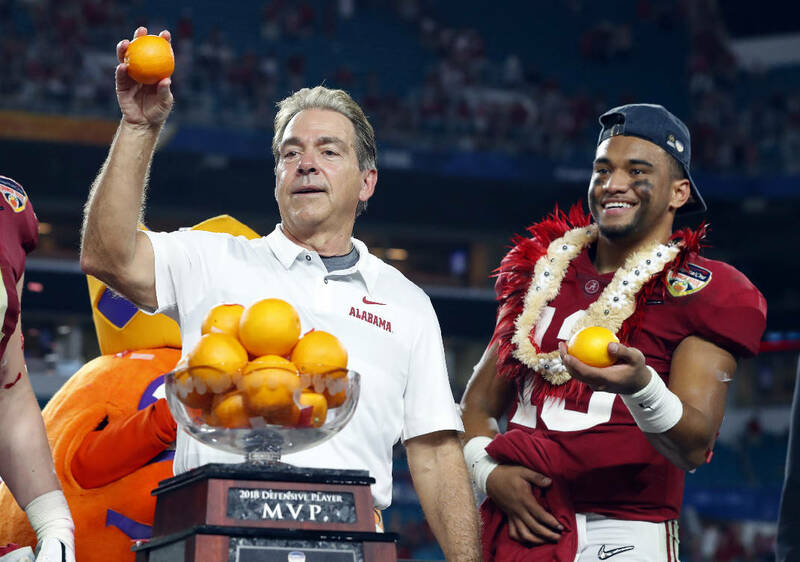 Well, other than NFL games and Winter Olympic broadcasts, Alabama football was among four of the of the top-10 watched sports broadcasts in 2018. Yes four, and it was spots 1, 3, 4, and 10. The next closest was three games of the NBA Finals made the top 10 at 5, 6, and 8. And her's betting that Monday's Alabama-Clemson game will be No. 1 among the non-NFL sporting broadcasts of 2019 too. The monster TV audience, however, will see some empty seats. According to this from YahooSports.com ace Dan Wetzel, ticket demand and prices for Monday's national championship game are at an all-time low. Saints (13-3). Best record in the league. Best quarterback-coach offensive symbiosis. (Side note: Symbiosis is making its debut in these parts. And likely its last.) 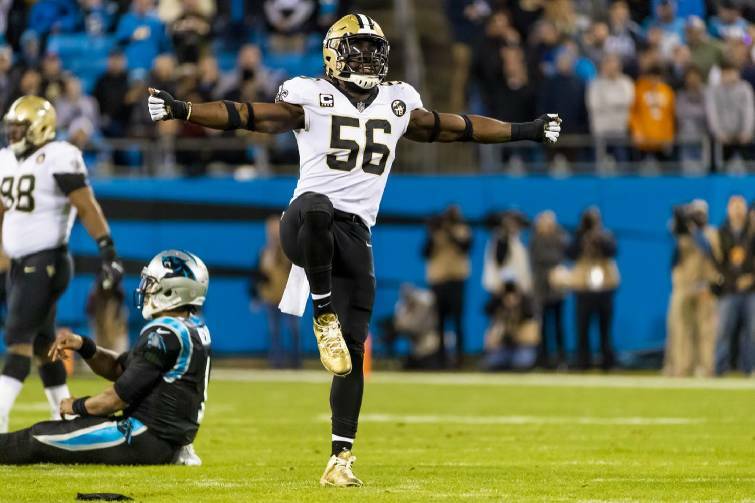 And considering last week looked more like the line of the final week of the preseason than the regular season, these Saints are not only homeward bound, they are rested. Rams (13-3). If the Rams are healthy, they have no reason to fear anyone. If Todd Gurley is early-to-mid-season Gurley and if Pro Bowl left tackle Andrew Whitworth can get on the field, this Rams offense is second-to-none. No team needed the bye more than the Rams. Patriots (11-5). Higher than the Chiefs? Yep. Sure a trip to Kansas City is daunting for a possible AFC title game, but — and we will talk a little bit more about this in a moment — is there any team, coach or player you trust in these playoffs more than the Pats, Bill Belichick and Tom Brady? Me neither. Bears (12-4). The best defense in the league by a wide margin will have to make things as easy as possible for second-year QB Mitch Trubisky. We understand the love for this turnover-crazed defense that scored six TDs during the season. On the bright side, the Bears will get a good understanding of where Trubisky is in terms of being a franchise dude. Side note: How much do you think the front office folks are wondering what this offense would look like with Patrick Mahomes or Deshaun Watson instead of Trubisky behind center? Chiefs (12-4). All things considered, the domestic violence case with Kareem Hunt is the biggest story of the NFL season. With Hunt, the Chiefs were a machine. Without him, they have been too one-dimensional. The whole Hunt story — especially the fact that the event happened months before the season — feels underreported by about 75 percent. 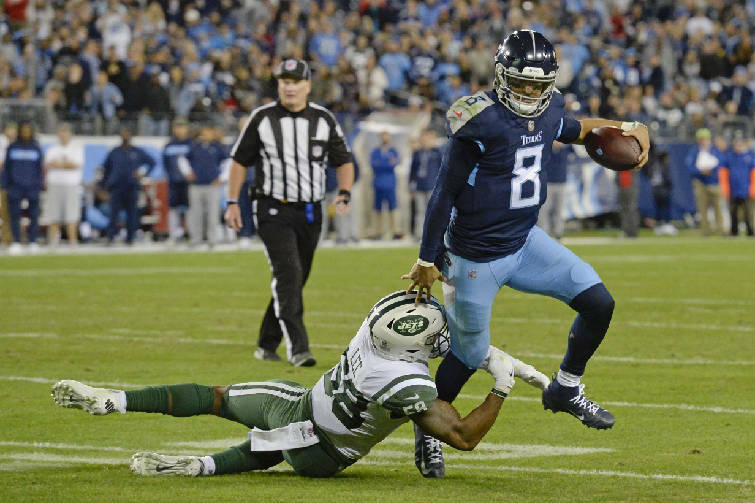 Tennessee Titans quarterback Marcus Mariota (8) gets out of the grasp of New York Jets inside linebacker Darron Lee in the second half of this past Sunday's game in Nashville. The Titans rallied from a 16-point deficit to win 26-22. Giants (5-11). News came out over the New Year's holiday from the Giants GM that the franchise is ready to move on from eli Manning. And the way the draft picks fell, the Giants are at No. 6. That''s incredibly important because the Jags, the other team that appears to be starving to draft a first-round QB, sits at No. 7. The top five — Cardinals, 49ers, Jets, Raiders and Bucs — either drafted a first-round QB last year or have a $20-plus-million dude on the roster. The wildcards here are potential trade partners if the Jags want to move up or what the Bucs may do at No. 5 entering the option year of Jameis Winston. Raiders (4-12). Jon Gruden's deals have netted the Raiders three first-rounders, the first of which is No. 3 overall, and according to Spotrac.com, the fifth-most cap space in the league heading into 2019. (Most cap space actually falls to Indianapolis, and if you are the Colts, are you not leveraging a front-ended deal for Le'Veon Bell to win now with Andrew Luck? A motivated Le'Veon Bell and Luck? Well, good luck with that AFC.) As for the Raiders, who knows. But Gruden and his 10-year deal — and a total "burn it completely down then rebuild" philosophy — are in this for the long haul. 49ers (4-12). San Francisco has the No. 2 pick in the draft and is set at quarterback. Their last five first selections have been line of scrimmage players — a tackle last year and four DLs before that. This team is starved on the perimeter offensively. After George Kittle's record-setting 1,377 receiving yards for a tight end, the next highest receiving total for any 49ers player was 487 by someone named Kendrick Bourne. You would have to think the 49ers are very interested in the happenings in Pittsburgh and Antonio Brown right now. Jets (4-12). One of eight teams — a quarter of the league mind you — to be searching for a head coach, and it makes sense because when you get blasted in your finale 38-3 and lose five of your last six, it's fair to assume former coach Todd Bowles had lost the room. How desirable is this gig considering the stage and the chance to work with Sam Darnold, who has had moments in his rookie season. Cardinals (3-13). It was one and done for former Arizona coach Steve Wilks. You know what, I'm OK with that. If you know you have the wrong dude, cut the cord, whether he's a deadbeat boyfriend or a no-where head coach. Side note: Did you see the story that the Cardinals and the Jets are interested in Kliff Kingsbury? What a strange offseason for Kingsbury, who was let go by his alma mater and has agreed to take the OC gig at USC and could be an NFL coach before the combine. Nuts. Who do you fear? That's a fair question. Who do you trust? That's a better question. Look at the field, and if we take away the top 2 seeds in each conference, the trust-factor with these teams is not exactly supremely trustworthy. With that, we head into the NFL playoffs riding a heater. Giddy-up. Los Angeles Chargers plus-3 over Baltimore. When healthy — and this is as close as the Chargers have been all season — Los Angeles has the best 1-through-53 roster in the league. It will be tested on the road in Baltimore this weekend, especially trying to stop the QB-run game the Ravens have embraced since turning the offense over to rookie Lamar Jackson. 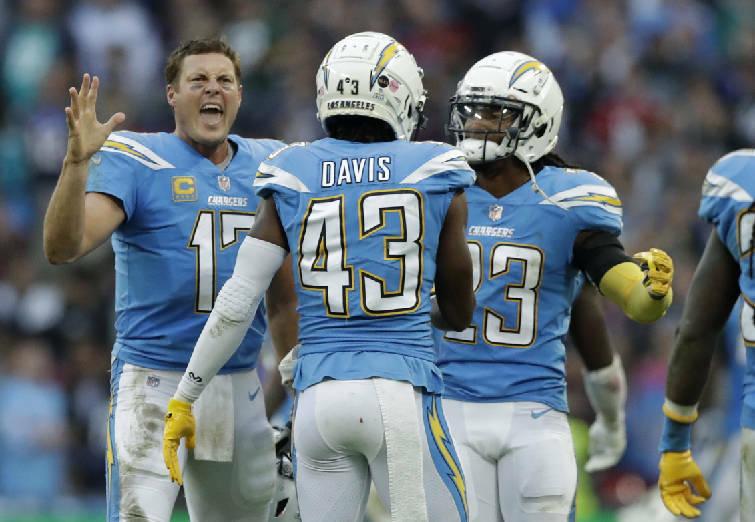 Jackson's impressive roll — he's 6-1 as the starter with 1,201 passing yards and a mind-numbing 119 rushes in those games — is concerning, but considering the plethora of weapons around Philip Rivers and a dynamic pair of pass rushers in Joey Bosa and Melvin Ingram give the Chargers too much. Indy plus-2 over Houston. Say what? Two road underdogs in the playoffs? Yep, but know this: This is most 25-and-youngr QBs starting in the playoffs with half the field. Now know this: In addition to making his first postseason start, Deshaun Watson plays behind the worst pass-blocking line in the league. Houston allowed a league-worst 62 sacks. Want to know which line was the best? Yep, the Colts, who allowed just 18 sacks all season. Seattle plus-2 over Dallas. OMG! Three picks, three road underdogs. OK, quick research number: Home playoff teams favored by 1-to-3 points since 2000 are a staggering 4-10 against the number, and just 1-6 over the last eight seasons. Simply put, when we talk about trust, which quarterback-coach combo do you trust more — Pete Carroll and Russell Wilson or Jason Garrett and Dak Prescott? Yeah, me too. Chicago minus-6 over Philadelphia. Yes we are a little fearful of Nick Foles magic and the experience of the defending champs. But Foles says he's going to play despite injured ribs, and you have to think this ferocious Bears defense is going to make sore ribs hurt even more. Yes, we are going against the theory of betting against quarterbacks making their playoff debut, but we're not sure Foles finishes this one, and if the Eagles have to turn to Nate Sudfeld, well, no es beuno. — Wow, did you see that Dickie V is pimping Rick Pitino for the UCLA job? Seriously. Man, in an effort to be more positive this year, let's just say that Dickie V is loyal to a fault. To an extreme fault. — Kawhi Leonard returns to San Antonio. Will the Spurs fans boo him or cheer him considering the way it ended there? — The committee's No. 3, 4, 5, 7, 8 and 9 teams each lost their bowl game. That's not exactly the strongest argument for an eight-team playoff. — This could be interesting moving forward. During its playoff broadcast this weekend of Colts-Texans, ESPN is moving Booger McFarland off the sideline cart and into the booth with Joe Tessitore and Jason Witten. Is that about the controversial cart blocking vision or a potential tip of the hand about next year's possible plan for the MNF crew considering the criticism Witten has received in his first season as an analyst? Mean Gene Okerlund or Gordon Sole. Discuss. Man Super Dave Osborne also kicked the bucket. Better death euphemism, "Kick the bucket" or "bought the farm" in your opinion? Discuss. As for today, Jan. 3, well some notable birthdays. Danica McKellar — Winnie Cooper from Wonder Years — is 43 today. Robert Loggia would have been 89 today. That dude has been in a million feature films, and maybe his most notable role was as Tom Hanks' boss in Big. Victoria Principal is 69. She was Bobby's wife on Dallas and a smoke show back in the day. Apple Inc. was born on this day in 1977. Mel Gibson is 63. He has a nice catalog of feature films. As for a Rushmore, let's go for the Rushmore of euphemisms for someone dying. Go, and remember the mailbag.